Pipkins, in a game last month against Huntley in an Elgin tournament. The Bogan junior "has the heart of a lion," his coach says. It looked like Luwane Pipkins and his Bogan teammates were in for a long evening Friday in the gym at Harlan, at 96th and Michigan. 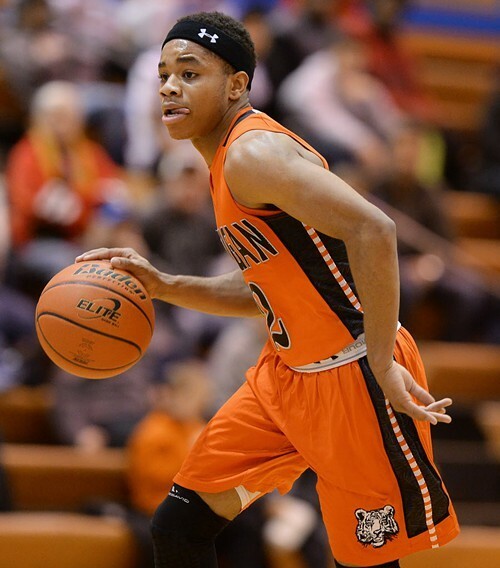 The Bogan Bengals, one of the city's top high school basketball teams this season, rely on Pipkins, a skinny 17-year-old guard with a deadly outside jumper. The jumper was not so deadly early in the first quarter: Pipkins missed his first shot—and his next, and his next, and his next. "Not your night," Ervin Bryant called to Pipkins from the Harlan bench after the fourth miss. Bryant, Harlan's coach, was trying to get in Pipkins's head. Pipkins knew it. "We're gonna see right now," he sang back to Bryant. Bogan's coach, Arthur Goodwin, realized why Pipkins was missing. The rim at the east end of the court—the end at which Bogan was shooting—was slightly askew. It was damaged in late December, and now the flexible rim doesn't always spring back to level after a shot bounces off. (Harlan plans to replace it soon.) Pipkins and his teammates were shooting at a tilted target. "The rim's low, adjust your jumper!" Goodwin shouted to Pipkins. Pipkins adjusted. He nailed a three, then a pair of two-pointers. He added a couple of free throws, and finished the quarter with nine points. Nine's not bad for an entire game for most high school players. It's hard to rack up big numbers in just 32 minutes. But as coach Goodwin expected, and coach Bryant feared, Pipkins was not nearly done. 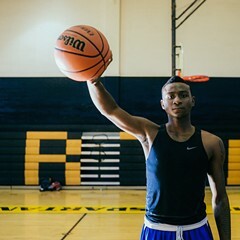 The five-foot-ten, 155-pound junior has been wearing out nets in various high school gyms in and near Chicago for more than a month now. 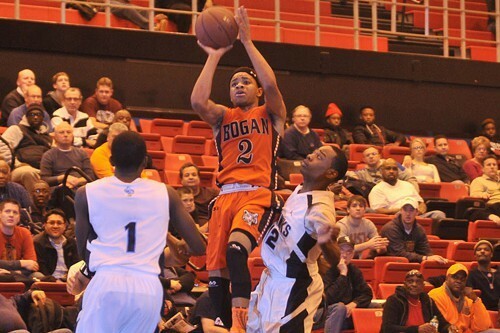 In the Proviso West Holiday Tournament in December, he led Bogan to the semis with games of 31 and 20 points. Morgan Park stung Bogan in the semifinal game by holding Pipkins to nine. But Pipkins bounced back in the third-place game with 32, as Bogan won by two. Before this date with Harlan, in six January games, all wins for Bogan, Pipkins had scored 26, 40, 33, 20, 24, and 33. The 40 points was his high school career high. Pipkins told me he'd been scoring more because Bogan's games have been close, and he'd felt a need to assert himself. "I just try to put the team on my back and take it to victory." He floated in a three early in the second quarter Friday—then sank another, and another, and another. So much for getting in his head, Coach Bryant thought. Suggesting to Pipkins that it wasn't going to be his night "just fired him up," the coach told me later. Pipkins sank two more free throws and drove for a layup. Sixteen second-quarter points; 25 in all by halftime. But Harlan led at the intermission, 38-35. Pipkins puts up a three in a December game against Hillcrest. Last Friday, Harlan tried denying him the ball, but it didn't work. Pipkins, who lives in Englewood, started playing basketball when he was nine. Before he reached high school, most of his baskets came in the lane. But in his freshman year at Bogan he played varsity as well as frosh-soph, and Coach Goodwin encouraged him to shoot more from the outside. "I guess he saw something in me," Pipkins said. That didn't take genius, Coach Goodwin told me. His players often compete in "around-the-world" games in practice, shooting from five spots beyond the arc, working their way from one corner to the other as they hit their shots. As a freshman, Pipkins was regularly making it around the world before the juniors and seniors. Pipkins "has the heart of a lion," Goodwin said. Unless he gets in foul trouble, he rarely comes out of games. With his quick hands, he often pokes the ball away on defense. And he's a sharp passer. He realizes that when he's double-teamed, as he often is these days, someone will be open—maybe fellow guard Tom Johnson, or Bogan's six-foot-seven center, Antonio Thomas. "I always tell my teammates, 'Cut to the basket,'" Pipkins said, and he's been finding them when they do. There were about 200 fans in the bleachers in the Harlan gym. They knew all about Pipkins. "Don't let him shoot! Don't let him shoot!" Harlan fans hollered whenever he got the ball in the Bogan front court. He missed a three-pointer as the second half began, but was fouled. A man behind me groaned. "Don't foul him on that!" he shouted. "Just contest!" Pipkins missed all three free throws. Soon after, though, he sank a jumper from the top of the key, cutting Harlan's lead to 42-40. He dished off to a teammate for an easy basket the next time down court. A few moments later, he drove to the basket and was fouled. This time he made both free throws, and now Bogan was up three. A minute later, he nailed a three. Then he stole the ball, sped down court, and laid it in. The fan behind me groaned again. "Talking about, 'He's weak.' He's killin' us." Pipkins was up to 37 points by the end of the quarter, but Bogan led by just one, 56-55. As another Bogan guard prepared to inbound the ball to start the fourth quarter, a Harlan defender leaned all over Pipkins. The ref said something to the defender; meantime, Pipkins, frowning, raised an elbow casually and planted it in the player's chest, letting him know that if the ref didn't take care of this, he would. The defender backed away. A Harlan three-pointer put the home team ahead early in the quarter. Pipkins responded with a three, then converted another turnover into a layup, and Bogan was in command. With just under two minutes left, Pipkins dribbled behind his back and blew by one defender, and was fouled by the next one as he went up. He swished both free throws, and Bogan led by ten. Pipkins grabbed a loose ball in the closing seconds and took it coast to coast. Final: Bogan, 84, Harlan, 72. And Pipkins, 46. A new personal best. The teams lined up and shook hands. Bryant, the Harlan coach, gave Pipkins a big hug. "Nice shooting," the coach said, and they both laughed. Later, Bryant told me: "He was in a zone. We tried denying him the ball, running two guys at him, running three guys at him, all of that. My kids didn't believe he could shoot the ball that well. They were like, 'Oh, he won't do that against us.'" In December, after a win over Morgan Park in which he scored 24, Pipkins told a reporter he thought he was the best guard in the city. Coach Bryant thought that was a little cocky for a junior. "But he's backing it up," Bryant told me this week. "He's making a believer out of me." Harlan and Bogan meet again tomorrow, this time at Bogan, provided that its gym floor is fixed by then—it sustained water damage recently. Coach Bryant thinks his team can win the rematch if it improves in one particular area. "We can't let Luwane get 46." Shot in the Dark, executive produced by Chance the Rapper, spends two and a half eventful years at the west-side high school.